It's a good day. My eye infection is clearing up and I'm not suffering from Second Sock Syndrome. 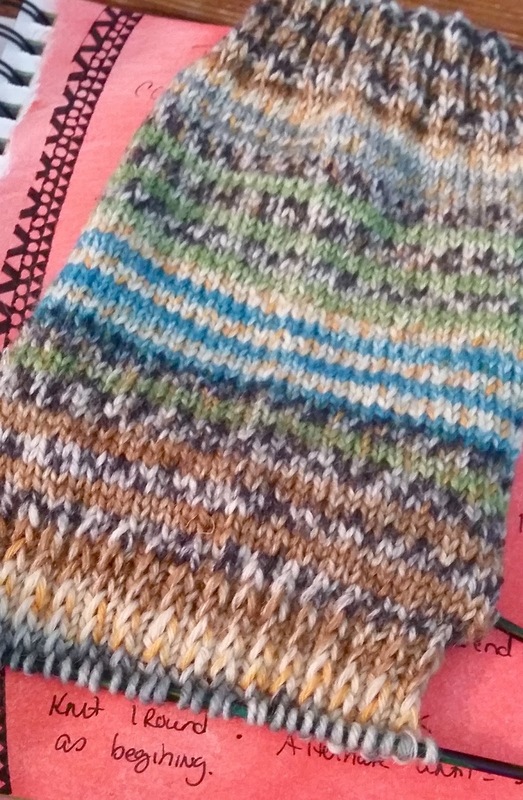 I just can't get over how quickly this Regia 6-fadig sock yarn knits up. 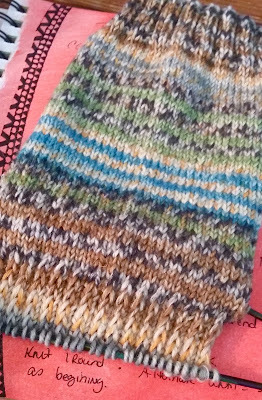 Despite being half blind for several days and only having a few minutes to knit each day, my second sock already has part of a heel flap! As for my eye, the heavy dose of antibiotics seems to be clearing up the infection fairly quickly. My eye is still draining a bit & I wake up with it crusted shut but the swelling has gone down considerably, my vision is back to almost normal (it's like wearing fingerprinty glasses instead of vaseline smeared glasses) and I no longer cringe in pain when I blink. Being able to shut my eyes and blink without pain has greatly helped my attitude! I'll be back to lacy knitting .... dare I say it? In the blink of an eye.